Please refer to our stock # maya85JGX when inquiring. This purse, named "Florentine Lilies", was created by Maya EXCLUSIVELY for our website and will ONLY be available here. ONLY 25 purses will ever be made. Each purse will be numbered and personally signed by Maya. Every purse will include a note from Maya as to why the purse was created and how it became named "Florentine Lilies". 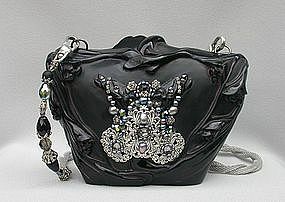 This carved and molded resin purse contains pearls, Czech and Austrian crystals, glass and cast metal beads, with a silver plated chain that can be worn as a necklace. Purse is 7" wide at the top, 4 1/2" wide at the bottom; 4 1/2" high and 2" deep with a 44" chain. A great purse for collectors as it surely will increase in value over time.